As conceptualized by scholars at the Stone Center at Wellesley College, relational resilience involves the capacity to move back into growth-promoting connections after an acute disconnection or times of stress. For parents and teens dealing with the issue of adolescent addiction, the relational rupture can feel irreparable. According to Sarah Barrett, LCSW; Galeet Farrow, LPC; and Jake Neff, MSS, LSW, substance abuse in adolescents typically manifests itself through problem behaviors, not overt signs of drug abuse. As adolescents begin to display negative behaviors and their functioning declines, parental fear and frustration typically translate into tensions between parents and children. On many levels, addiction is about relational disconnect from the self and others. Activating the relational resiliency between parents and children is both a therapeutic goal and an agent of change in the treatment of adolescent substance abuse. Drawing on their own personal experiences as mother and son, Barrett and Neff offer a unique perspective on the relational resilience that both parents and adolescents can develop through this challenging experience. Restoring the parent-child bond can have a significant impact on the therapeutic outcome. “Peer influences are important, but the resilience research shows over and over that the primary protective factor is the connection between the adolescent and a caring adult, most often a parent,” Barrett says. “Often parents feel that that there is no room for negotiation with their kids, but in becoming controlling they lose the connection and the kids drift to peer influence,” Neff adds. In their work with parents and adolescents struggling with addiction, Barrett and Neff view it as a collaborative process, which includes the parents as part of the team. 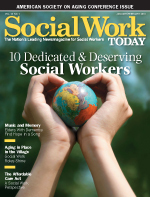 It takes a lot of self-awareness on the social worker’s part, Barrett says. Keep in mind that sessions can be challenging.